Nineteen thirty-seven is a year that should be high lighted on Grande Prairie’s Hockey calendar. It was a year significant firsts. It marked the first successful hockey league in the Peace River Country and the first use of the term Wheat Belt as an umbrella under which senior teams north of the Peace River have played since then except for a brief period during the war when it was replaced by the National Defense League (NDL). In 1937 it was called the Wheat Belt Hockey League (WBHL) and it operated for five years before the NDL era. Competitors in the WBHL played for the Canadian Utilities Cup. Following the war it became the Northern Wheat Belt League (NWBL). Nineteen thirty-seven also marked the first year that the popular team name, the Red Devils appeared. Grande Prairie had the largest population in the Peace River country from which to draw players. While the hometown boys had strong support from the public in terms of attendance at games their fans had high expectations for the team. However, the team was not always able to live up to the fan’s expectations. For the six years before the WBHL was replaced by the NDL the Red Devils won the league championship only twice: 1941/42 and 1942/43. Teams from Clairmont, Sexsmith or a combined team from the two communities won the WBHL for the first four of the six years. In spite of their early success that was the last time that Clairmont and/or Sexsmith entered teams in league play involving teams from Grande Prairie. “(Back left) Warren Odel, John Shields, the unnamed man,Charlie Turner Sr., Harold Oxley, Bert Haggart, Jack Kerry, Bill Storm and Bert Bessent ( members of the Red Devils executive) (Centre left) Reg Shanty, Charlie Turner Jr., Dean Spicer, Earl “ Pee Wee” Parish , Charlie Stojan, Frank Edmundson and Al “Phooey” Wright (Front left) Pal Powers, Denis Law, Roy Wright, Bob Card, Hammer Davis and Ben Emerson.” Note: Ben is the father of Dave Emerson (well known British Columbia Politician). Another competition took place annually to determine the best team in the north west i.e. hockey north and south of the Peace River. An all star or regular team representing areas north and south of the Peace played for the Maple Leaf Petroleum Cup for four seasons between 1938/39 and 1941/42. Games for the championship alternated between Grande Prairie and Peace River. When the competition was held in Grande Prairie it was held in conjunction with the town’s annual Winter Carnival. The Hockey Record book indicates that the Red Devils, representing hockey south of the Peace won the cup two of the four years. An invitational hockey tournament was featured at the annual carnival with participating teams playing for the Kerr/Orr and Croken Challenge Cups but the Red Devils were not eligible to play in the Challenge Cup events. Teams that participated in the first two WBHL seasons (1937/38 – 1939 – 40) included the GP Red Devils, Sexsmith and Clairmont in the North and Wembley, Beaverlodge and Hythe in the west. If teams were lucky they carried six forwards, four defensemen and a goal tender. Johnny Macdonald was the Red Devil’s Team Manager, Pal Powers the Coach. The Red Devil lineup for the 1937 - 1940 included, Pee Wee Parish in the net, Schribner, Allan (Phooey) Wright and Dalgleish on defense, Roy Wright, Rusty Black, Charlie Turner, Frank Edmundson, Dennis Law and Duffy making two forward lines. Star players took shifts as long as they could breath – thirty-second shifts were unheard of. Wearing their Red Devil sweaters. Phooey (Allan) Wright, Pee Wee Parish and Kelly Wright pose for a picture on the Montrose Public School outdoor rink. All three were killed in action in WW11. Both the Tribune and CFGP provided coverage for the WBHL games and 1937/38 was the first time in the history of hockey in the Peace River country that hockey statistics were kept and reported. Frontier Lumber, a staunch supporter of Grande Prairie hockey over the years sponsored broadcasts of the games over the newly established radio station CFGP. A.R. McMillan was the play-by- play announcer: the announcer identified earlier who was too slow to suit Sports Reporter Bud Powell who covered hockey for the paper in a column entitled “On the Sideline”. It does not indicate where the message came from but there is a report that Sports Commentator Rex Harper received a wire from an “outside” source recognizing the WBHL as the northern most hockey league in the world. The paper wrote a story about an interesting hockey ruling on the ice by a referee in 1938 when he insisted that a player taking a penalty shot took the puck at his own blue line and had to shoot at the opposing goalie from their blue line. He was criticized for an incorrect ruling at the time but according to the rulebook in 1938 he was right. Given that ruling few if any goals would be scored today and perhaps even then according to such a rule. An exception may have been Roy Wright who had a blistering wrist shot that travelled six to eight inches above the ice at blinding speed from the blue line to the net. He had the hardest shot in his era and it earned him at least one WBHL scoring title. With no crystal ball to predict events that would unfold in the fall of 1939 the hockey season began with a flourish in January, 1939 when the Hockey Train special described earlier travelled from Rycroft to Hythe picking up fans along the way all but “swamping” the tiny Hythe arena. Perhaps it was a winter of especially heavy snowfalls as it was also the year that a snowmobile was needed to transport the Red Devils to Beaverlodge in order to play a game. Newspaper accounts in 1938/39 provide insight into the town’s expectations for the Red Devils and the “fallout” when the hometown boys failed to live up to expectations. After all - the pool of players from which Grande Prairie could draw was much larger than the available player pool in the smaller surrounding towns against whom the Red Devils played. In the process of describing the outcome of the 1938/39 season ending tournament, Rothwell of the Tribune, in his column “The Weekly Lineup”, describes pressure faced by the legendary Red Devils. 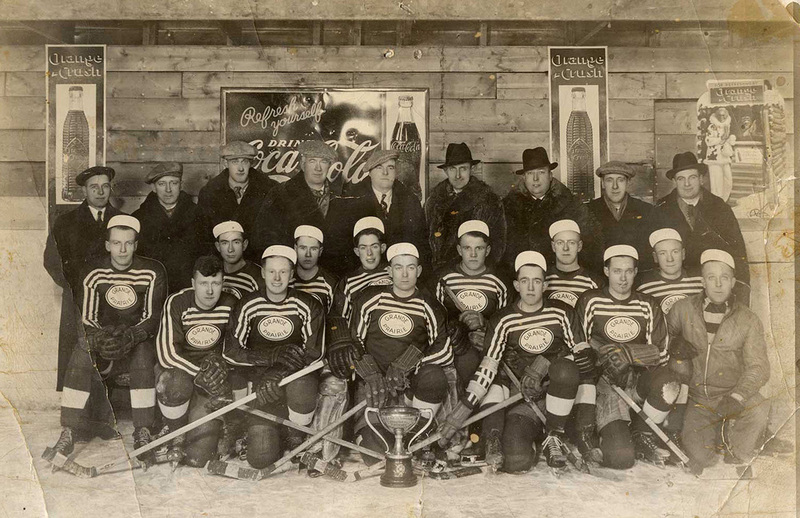 A hockey tournament was scheduled for Feb. 28 – March 4, 1939 in the Wapiti Arena and was held in conjunction with a winter carnival. The Tribune advertised that “Together with the hockey tournament will be held the annual winter carnival, with masquerade ice carnival for which prizes will be awarded, moccasin ice dance, street events, dances and picture shows.” The Red Devils looked good in their flashy red and black sweaters and Grande Prairie fans were convinced that the hometown boys would capture the silver that would go to the best team. Four coveted silver trophies: the Challenge Cups, the Canadian Utilities Cup to honour the WBHL champions and the Maple Leaf Petroleum Cup to recognize the best team in the Peace country were up for grabs. Much to the chagrin of Grande Prairie fans and the media Grande Prairie failed to capture even one trophy. When it was all over Rothwell in an article dripping with sarcasm summarized the sentiments of 800 Grande Prairie fans who watched the final game. To begin with Rothwell suggests that following Grande Prairie’s loss of the Maple Leaf Petroleum Cup to the Peace River All Stars by a 1 – 0 score, Red Devil Players were walking in groups of three and sticking to back alleys to avoid interacting with fans. “Some of the Red Devils, he reported, “are complaining that the snow in back alleys is pretty deep for this time of year.” He goes on to report that the Red Devil player who said he would pop anyone who mentions the game would be a very busy man if he were man enough to stick to his word. The game was the talk of the town and was accompanied by rolling eyes and raised eyebrows. Adding insult to injury a week later the Red Devils lost the Canadian Utilities Cup to, of all teams, the Sexsmith/Clairmont Rangers by a score of 5 – 4. Odds makers were betting 5 – 1 in favour of Grande Prairie. Rothwell went on to say “It was certainly a case of the last shall be first.” In order for the Red Devils to come away from the tournament with something it was suggested by a disgruntled fan that the Kerr/Orr challenge cup be locked in a safe for safekeeping. Another suggested praying for a chinook lest the tiny hamlet of Dimsdale challenge the Red Devils for the Kerr/Orr cup: and there was more. Red Devil team members included: Parrish, goal; R Shantz, Davis, A. Wright, Roy Wright, Turner, Law, Edmundson, Spicer and Card. They were humiliating defeats for a line-up of skilled players. That only goes to show that the Peace country was replete with hockey talent scattered around the district – it still is. Women’s hockey in Grande Prairie enjoyed a better fate. The 1937, December 2nd issue of the Tribune reports that a women’s hockey team was organized that season. “Not satisfied to confine their activities to softball, badminton or other games a goodly number of Grande Prairie young ladies have decided to invade the hockey field. This decision was made at a meeting held in the home of Reg Foster at which some fourteen people were present. Reg Foster was chosen as manager and other members of the organization included Miss Dorothy Guthrie Secretary, Treasurer, and Miss Dorothy Crummy Business Manager. Coaching was Phat Jones and at the meeting he is reported to have delivered an interesting talk on the subject of hockey. At the Grande Prairie Winter Carnival in 1939 the women’s team, the Grande prairie Montrose Stars were pitted against a team from Sexsmith. The Stars won the game 3 – 0. Players from Grande Prairie in that contest included: Muriel Halverson goal, Pat Smart, Dorothy Patterson, Elsie Mills, and Alice Henning, defense - Agnes Wright, Vera Guittard, Norma Swanston, Evelyn Knight, Virginia Clarke and Alma Clarkson, forwards. The names of Halverson, Henning, Wright, Guittard, and Swanson are all well-known hockey family names. The name Phat Jones appears in the paper from time to time in 1939 but his eventual fate as the precursor of the present day City Athletic Directors is unknown. His name fails to show up after 1939. Perhaps WW11 had something to do with it. As for the Red Devil label – except for two years during WW11 it persisted for twenty-seven years until 1954 when the legendary name, red and black colours and distinctive logo became controversial giving way to the Grande Prairie Athletics with yellow and black uniforms still worn today. Yet another first in 1937 was an announcement in the fall that the Frontier Lumber Company would be sponsoring live play-by-play broadcasts of important hockey games and was building a booth for the announcer. This booth would become the office and “tea room” for the widely known and popular play-by-play announcer GP Hockey Legend Fran Tanner: the Peace Country’s Foster Hewitt. (Click on the link under Fran’s biography and listen to a sample of Fran’s play-by- play announcing-he was good). When names of Grande Prairie Legends first appeared in the media during the thirties the record shows that there was peewee, midget, juvenile, junior, old-timer, senior men’s, senior women’s and old-timer hockey. From the first puck drop announcement in 1914 it is likely that Grande Prairie had a continuous line of senior teams under names such as the Wapiti Club, The Silvers, the Maroons, the Weasels, later the Red Devils and finally the Athletics. Until the 1937 reference to the Wheat Belt League there is no indication that there was any organized hockey league in the Peace Country. A Tribune article dated Oct. 29 1937 comments on the goal of a special committee of the GPAA set up to “form hockey leagues in the district.” Their proposal was “…to form a local league with one or two teams from here, Clairmont and Sexsmith. Efforts will be made to induce hockey teams in the west district to organize a league, it being suggested that Wembley, Beaverlodge and Hythe and possibly Valhalla might get together. This still leaves some mighty good hockey material at LaGlace, Northfield and Buffalo lakes, where possibly a third league could be formed.” It is likely that the term league was used to describe competitions that more closely resembled short-term tournaments. That changed in the 1938/39 season. Political turbulence in Europe was to bring about great change but it would be some time before the declaration of war in September 1939, would have an obvious effect on Grande Prairie hockey. News that burned over the wires on Sept. 1, 1939 completely altered the course of history - like an unexpected turn in the road with no map or GPS to predict what lay ahead: news that Germany had invaded Poland. Two days later England and France declared war on Germany marking the beginning of WW11 and seven days later Canada entered the fray serving in the Army, Navy and Air Force. The war had enormous social, political and economic consequences for Canada. Forty five thousand Canadian lives were lost, 54,000 participants wounded, the cost of the war was estimated at $21,786, 077,519.00 and yet the Canadian economy was significantly strengthened bringing an end to the stifling economic stress of the thirties. Furthermore the war strengthened Canada’s position on the world stage as a significant entity in its own right not just as a dependent child of the British Empire. 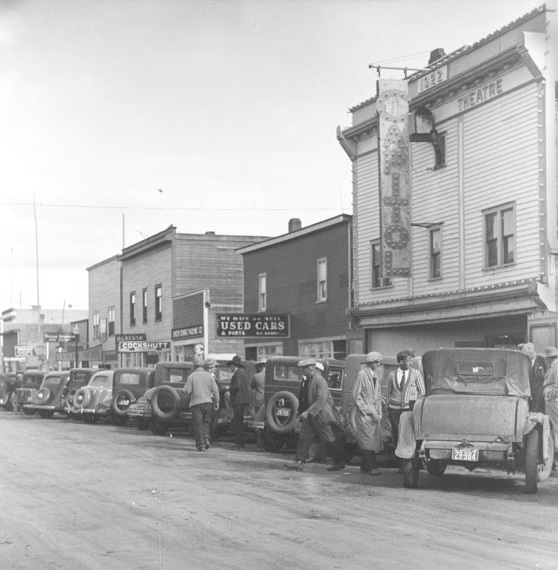 The Peace Country and Grande Prairie in particular prospered from the war with markets suddenly opening up for agricultural and forestry products. In addition, the airport in Grande Prairie became a major platform on the Northwest Staging Route to support construction of the Alaska Highway bringing with it additional financial benefits. In keeping with social and economic changes brought on by the war the course of hockey was significantly altered. Unlike WW1, hockey did not grind to a halt during WW11. Thanks to Bert Bessent and his protégés there was a substantial foundation for the game in Grande Prairie. The war introduced a unique chapter in hockey: not just by Grande Prairie standards - by any standard. Today’s seniors who have first hand personal memories of circumstances in Grande Prairie during the war are rapidly vanishing. Young people today might find it interesting that during the war the eerie sound of air raid sirens would pierce the night at unpredictable times signaling a blackout and put everyone in town on notice that all lights were to be doused, blinds pulled, and shutters closed. Reservists stood ready to perform defensive duties they had been assigned. It was practice for the remote possibility of an air raid strike. That was indeed a remote possibility but perhaps the authorities felt it was a useful exercise to remind people far from the front lines that Canada was at war. Billy Bessent recalls that the war overseas stimulated a certain level of paranoia at home. As the story goes some self-educated young architects and builders constructed a sophisticated underground fort in the woods bordering the town. Upon discovering the fort some paranoid adults were convinced that Germans had invaded the town and the fort was their hideout. One can imagine the snickers this overreaction evoked from the kids who constructed the fort. An interesting product of the war were ration booklets provided to every family. Food supplies such as sugar, butter, coffee and meat were rationed and other products were often in short supply. Can you imagine a concession stand at a rink without coffee? Roasted wheat was sometimes used as a substitute for coffee. Sugar incidentally was an ingredient in the making of explosives. Rationing was a creation of the Wartime Prices and Trade Board established Sept. 3rd 1939 by the Federal Government as a measure to control inflation. Although it was contrary to regulations, housewives were often known to trade ration tickets. By law, unused ration coupons were to be returned to the issuing agency. Quite apart from rationed goods many staples were difficult to obtain and merchants were known to play games with holding scarce goods for favourite customers or to gain favour with the “Who’s Who” of the town. “I remember writing a story in grade school I entitled, “No Mrs. Neufeld, I have no jello”. I guess my Mother was not one of Grande Prairie’s “Who’s Who” in the eyes of the grocer. While shopping Mother asked the grocer for jello and was told “I got no jello”. However, as Mother continued her shopping she observed the grocer providing jello for a favourite client.” (Margaret Neufeld-Froese). Car dealers were directed to give priority to people who required vehicles for business activities. This along with rationing for gas and tires completely changed the complexion of teams and competition in hockey at the local level. For example, it curtailed discussions about leagues between distant towns. However, as we shall see, the war brought the ingredients of a unique league into the boundary of the town and Grande Prairie introducing several years of entertaining hockey. Another important consequence of the war is that it brought an immediate end to soup kitchens and unemployment. Instead there were soon shortages of employees especially men. “My father, six uncles and a cousin enlisted and I recall purchasing special postage paid blue tissue paper thin stationary to write letters for overseas delivery and on special occasions (Birthdays or Christmas) sending telegrams from the local train station to the boys overseas. Also I recall my Mother sending parcels to her brothers away from home: parcels that contained home baked goods and when possible the scarce commodity of a chocolate bar - no jello! !” (Ron Neufeld). While the removal of young men age 18 – 35 had a significant effect on hockey at home it flourished in an unpredictable manner. As for the hockey players who enlisted - they played wherever they could find a rink elsewhere in Canada while training for action. At least two hometown boys played hockey overseas along with other Canadian boys laying the groundwork for the post war English League and hockey elsewhere in Europe. It is naïve to think that every young person’s motive for joining up was purely patriotic but whatever the motive there was little patience in Grande Prairie for eligible young men who failed to enlist in the war effort. If one saw a war eligible young man on the streets of Grande Prairie during the war he was likely in uniform: home on furlough or a member of the armed forces stationed in Grande Prairie. On November 4, 2014 an article entitled “Dispatches From Juno: Hockey During the Second-World War” appeared on the Internet. It announced that the Juno Beach Center was collaborating with The Ontario Hockey League to commemorate the 70th Anniversary of D-Day and the Normandy landing. The Juno Beach Centre, located in Normandy, France is a museum dedicated to honour Canadian troops (14,000) who landed on Juno Beach on D-Day, June 6, 1944 including airmen, such as Hockey Legend Max Henning who played a vital role in the liberation of France. During the course of the “British Commonwealth Air Training Plan” Canada trained over a million aircrew at training bases and aerdromes that sprang up across Canada. The air base at Grande Prairie participated in this program. So – what does hockey have to do with this? Why a partnership with the Ontario Hockey League? According to the Juno Dispatch, “Canadians stationed in England trained for years before being sent to Sicily and Italy in 1943, and to Normandy in June 1944. 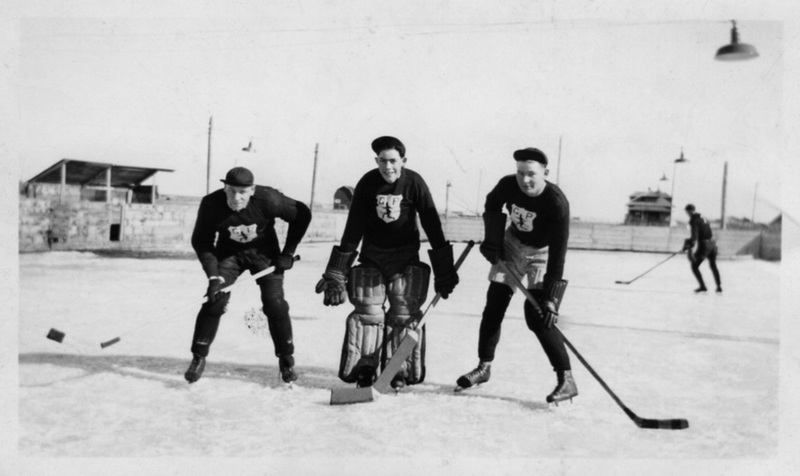 Hockey was central to the social fabric and cohesion of the units stationed there. Tournaments on bases in Canada and in English towns enabled Canadian soldiers and English civilians to interact around the social event that a hockey night creates. The Maple Leaf, the Canadian Army’s newspaper during the Second World War, reported on games as did the plethora of regimental newspapers published in the field to provide humour and news from home for the fighting man overseas.” Most importantly, when the puck dropped in the face off circle and it was “game on”. Players and spectators were able for the duration of the game to forget the horrors of war – the risks to life and limb – the consequences of dropping bombs and flying bullets. When the puck dropped the war stopped. Grande Prairie sacrificed at least sixteen hockey players to the war during the six years 1939 – 1945. In 1938 Pee Wee Parish was working in the Royal Bank and playing hockey with the local boys – he was a goalie – a great position to develop nerves of steel. Upon hearing news of the war in Sept. of 1939 he enlisted in the RCAF. On the first of January 1941 the Tribune reported that a minute of silence was observed at a senior hockey game in honour of Pee Wee, a former local hockey player who died overseas in an airplane accident on December 1, 1940 – scarcely a year after he enlisted. He was the first Grande Prairie hockey player to die in service for the Allied cause. Later that year on June 19, 1941 the Tribune announced that Four Wright brothers had enlisted. “ Four Wright brothers, sons of Mr. and Mrs. Pete Wright of Grande Prairie, have joined the colors. Allan is with the Canadian forces in Britain. Clifford is with the Army at New Westminster. Kelly left on Tuesday to join the Air Force at Brandon. Roy left on Tuesday to take his final medical in Edmonton. He will be training for an air gunner.” They were all hockey players and youngest brother Pete was poised to follow in their footsteps in 1945 but a shoulder injury while playing hockey delayed his ability to enlist and the war ended before he was healthy. 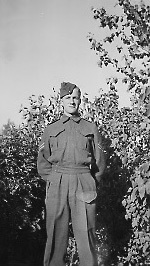 However, in preparation for the possibility of going overseas he served his country as a member of D–Company, Grande Prairie’s Army reserve contingent and he was a junior star on their hockey team where his skills were sharpened by playing against mature men. At age eighteen in 1941 Hockey Legend Max Henning signed up. A year earlier Max spoke to recruiters who urged him to finish another year of school. Following basic training and graduation from flight school he was assigned to overseas duty and at age nineteen became the pilot of a B-25 Mitchell plane. “I always wanted to fly,” said Max. “As a kid if I saw a plane fly overhead I spoke of the experience for two weeks after.” His young crew (age 17 – 20) consisted of a wireless operator, air gunner, turret gunner, and twenty-year old navigator - the old man of the crew. During his three years overseas he flew thirty-eight missions as part of a squadron that played an important role in the liberation of France. One mission was to bomb a runway in Vitry, France to prevent its use by the Germans. Later, with the Germans in retreat Max recalled, “We needed the runway for our own planes.” No heavy equipment was available so members of the squadron were given a truck and armed with shovels they repaired the runways they had just bombed. Considering Max’s past experience and superior ability to dig cars out of snowdrifts in order to get to hockey games during blizzards in Northern Canada you can bet he was the squadron’s greatest asset while clearing the runway in Vitry. Max readily admits to “nerves” every time they set out on a mission. “I always used to shake. So did everybody else until I got into the pilot’s seat and started the motors – I wasn’t brave like they say.” According to Max, “All flights were close and dangerous … I cracked up-had a couple crash landings. We were lucky to survive.” Max lived every day with the knowledge that each mission might well be his last and yet when the time came to slip into the pilot’s seat of the Mitchell Max never shrank from taking his place at the controls. That is true bravery. Neatly framed on Max’s wall is a rabbits’ foot. Max’s boyhood friend’s Mother, Mrs. Card gave the rabbit’s foot to Max as he left for England. With a wry smile and a chuckle Max reports, “That’s why I’m here today.” Max never had a chance to play hockey in Europe but he did play English rugby while stationed in France. He describes rugby as a form of “unarmed combat”. Max in full dress, Max at the controls of the B – 25 Mitchell Bomber he piloted for thirty eight missions, Max and his crew and a picture taken from Max’s plane when they were flying in formation during one of his thirty eight missions. Early in March 2015, Max received a special surprise. By an order of the President of the Republic of France, Max was awarded the rank: “Knight of the French Order of the Legion of Honour” in recognition of his efforts in the war that were an important part of the Allied resolve to liberate France. Max has a picture of nine boys with whom he played hockey before the war. He was the only one of that team to return home. Upon his return to Grande Prairie he immediately took to the ice and is recognized today as a Legend in the Builder category for his unselfish devotion to ensure that young people who followed in his footsteps had facilities to play the game he loved. Max played old-timer hockey until he could no longer lace up his skates. Max and hockey are long time friends. Max Henning and his medal. Along with Max, Billy Bessent has an equally gripping tale to tell. As noted earlier, Billy had a twin brother – they were inseparable buddies growing up. It was a September afternoon 1942, the war was raging in Europe - the seventeen year-old twins and their companions sat on the steps of the Grande Prairie Court House pictured earlier - their favourite gathering place. Just how the conversation went is not known but recruiters for servicemen were in town and the twins decided to enlist – undoubtedly the most important decision they had made up to that point in their lives. Imagine being a recruiter confronted by two small identical boys who looked more like pre-teens than seventeen year olds. They claimed to be “of age” and were there to sign up. Sign up they did but there was a condition in order to formalize their decision – they had to produce proof that they were as old as they claimed to be. As the story goes they went home, told their parents and father Bert returned with them to the recruiter’s office. He was armed with passports to prove their age and support their decision to join the armed forces. That was surely a painful decision for the Father of the twins. As far as we know, neither Billy nor Bobby played hockey overseas but they played whenever possible during their basic training while still in Canada. One year after enlisting the twins landed in England where they began their military careers as gunners on Lancaster bombers. It was December 17, 1943, just a year after arriving in England. On that fateful day four lads from Grande Prairie, Billy and Bobby Bessent, Gerald Strang, Billy’s roommate and Sandy Saunders gathered in Billy and Gerald’s room. Bobby, Gerald and Sandy were called for a mission to Berlin that night and Billy went to see them off. According to Billy it was a successful mission but a heavy fog settled over England during the mission. On their return to home base their plane crashed along with thirty other bombers. Bobby, Gerald and Sandy lost their lives in the crash. Bobby was not yet nineteen. 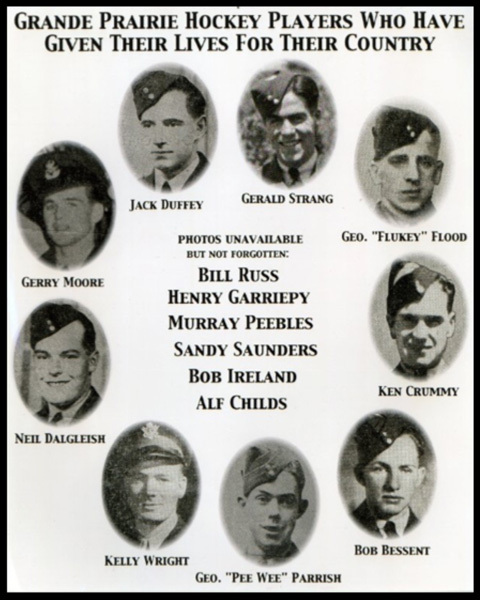 “We lost three crews from the 405 squadron. After that I was the only one left. That evening my three crew members didn’t make it. My crew did one more flight from there.” (Billy Bessent). The loss of planes but more importantly the loss of lives was staggering. Bobby, Gerald and Sandy were buried with full military honours in the Cambridge, England military cemetery. Several days later another skilled hockey player from Grande Prairie lost his life in active combat – Lieut. M. R. (Kelly) Wright, older brother of Hockey Legend Pete Wright. 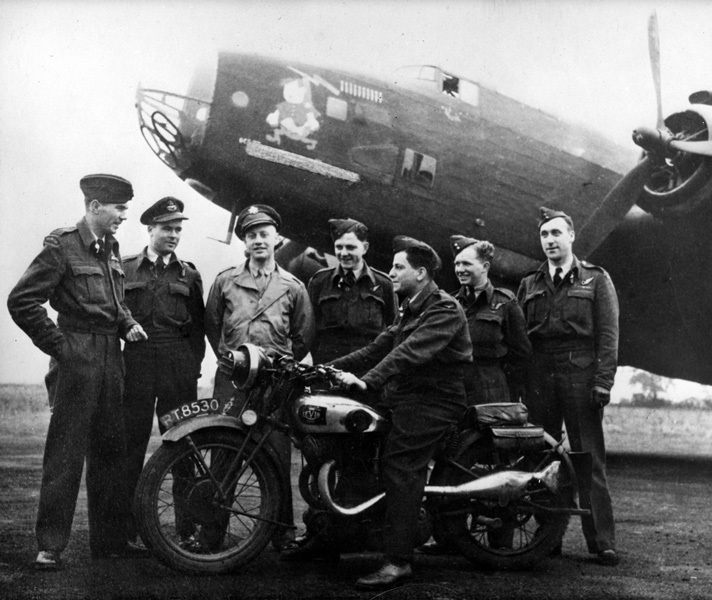 Billy Bessent and his 426 Squadron - (Left to right) Don Patterson, pilot, Lorne Davies, rear gunner, Frank James, Bomb aimer, Harry Owens, flight engineer, Billy Bessent, mid upper gunner. Cliff Evans , navigator, Paul Kaiser, wireless operator (on motorcycle). 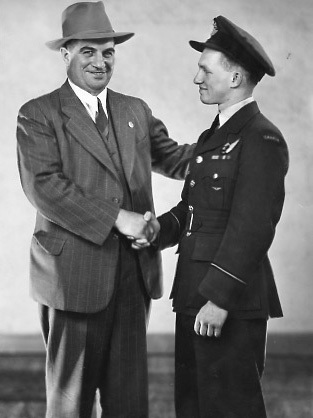 Bert Bessent meets his son Billy in Edmonton on the way home to Grande Prairie. Billy was exceptionally good at his job resulting in a well-earned Distinguished Flying Medal. In spite of valuable service provided by the Bomber Command further recognition they deserved from Winston Churchill, and the English and Canadian Governments failed to come. In 1992 a CBC documentary depicted them as irresponsible killers of civilian life and property. Finally, in 2012, sixty-seven years after the war – too late for many of Billy’s crew to appreciate, the Queen unveiled a Bomber Command Memorial in London in honour of the role played by the Bomber Command. Canada later followed suit. At 90 years of age the war holds bitter/sweet memories. Billy is well aware that he survived the war and returned home against significant odds. His first job when he returned from overseas had to do with hockey. He accepted a job as Manager of the Wapiti Arena – a building with many special pre-war memories. Billy immediately hired returned veteran and Hockey Legend Fran Tanner as his assistant. Although Fran was four years older than Billy they had played hockey with and against each other before the war. When Fran joined up is not known but we do know he was assigned to the Army Tank Corps - another dangerous posting. Prior to the war he was known in Grande Prairie as an all around athlete having participated in baseball, hockey, boxing and in track and field events: he was a sprinter. Fran credits his survival of the war to his sprinting ability. He reported many “close calls” but one memory stood out above the rest when his tank was hit and disabled by a bomb. Fran immediately sprang from the turret of his maimed tank and thanks to his speed he reached cover before a bullet found him. His partner, lacking Fran’s speed and agility was shot and killed. Fran’s post war contribution to the Golden Days of Grande Prairie senior hockey as a play-by- play announcer is well known and his athleticism came in handy for the ascent and descent required to get into and out of the gondola that, like an eagle’s nest was precariously suspended in the rafters of the Wapiti Arena. The gondola from which he watched combat on ice might well have reminded Fran of the tank turrets from which he engaged in deadly combat during WW11. All told sixteen young men who had played senior hockey including several Red Devils joined up and served overseas. According to available information only two of the sixteen played overseas: Charlie Turner and Roy Wright. 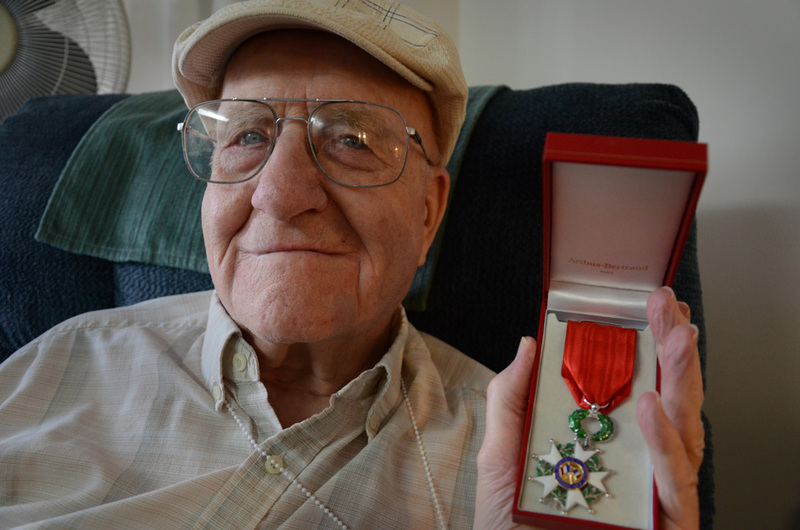 Charlie served overseas in the Intelligence Corp. - Roy was a gunner in a Lancaster bomber. Details of Roy’s hockey experience in England are not known. However, he was well known in Grande Prairie as a highly skilled player: always a contender for the Wheat Belt scoring title, winning it upon his return from the war in 1937 – 38. In 1932, a “kid line” consisting of Roy Wright, Charlie Turner and Dennis Law, were called up to play for the senior team. Roy was sixteen. Throughout his playing career Roy was rugged, impossible to knock off the puck and had an intimidating, accurate wrist shot that travelled six/eight inches off the ice from the blue line to the goal. As for the player who centered Roy’s line, an article in the Tribune immediately after the war reported, “Charlie Turner is making good in the Canadian Army sports.” Charlie had always dreamed of testing his hockey playing skills with or against NHL players. That dream was realized overseas where he played on a team with the famous Boston Bruin “Kraut Line” that consisted of Milt Schmidt, Woody Dumart and Bobby Bauer. The Kraut line were Canadian boys who enlisted as a trio and served in the RCAF from 1942 – 46. Kraut is an abbreviation for sauerkraut, used as a slang term to identify German roots. A Tribune article dated Jan. 17, 1946 reported that Charlie’s team dominated in their league – a league that consisted mostly of professionals and during the war toured Scotland playing in five different cities. It is likely that Roy played in the same league as Charlie, maybe on the same team. In terms of Charlie’s record at home – if Roy failed to win the scoring title it was likely Charlie. Over the years Charlie was one of the Peace countries most respected and talented players. The sixteen Grande Prairie hockey players who served their country overseas are an impressive line up as follows: Four Wright Brothers, Roy, *Kelly, Allen and Clifford, the Bessent twins, Billy and *Bobby, Charlie Turner, Max Henning, Bob Card, Ernie (Baby Face) Nelson, *Gerald Strang, *Harold (Sandy) Saunders, Fran Tanner, Doug Guittard, *Earl (Pee Wee) Parish, and Bob Hunter. Although they never played together as a team that’s three forward lines, four defensemen and two spares – Pee Wee Parish was a goalie. They would have been an impressive line up at home. An * denotes players who lost their lives while serving their country. 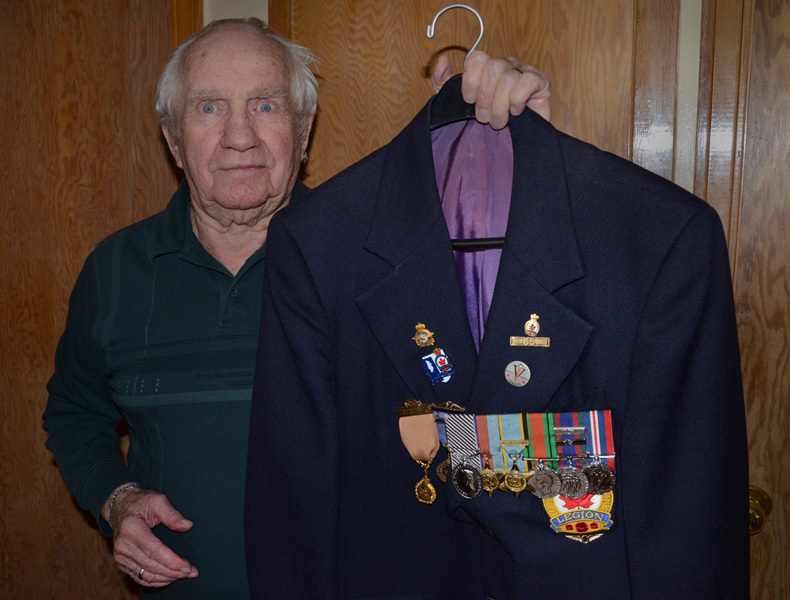 Apart from Charlie and Roy who played hockey while overseas, the war interrupted their game but all of the veterans who survived returned to the ice upon returning home and provided leadership for the Golden Years of senior hockey in Grande Prairie and will be covered in a later episode of this series.